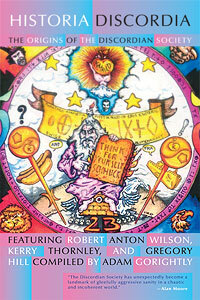 reviewing the Discordian Archives at Robert Anton Wilson’s pad, spring of 2001. HistoriaDiscordia.com is dedicated to documenting the origins and history of the Discordian Society and as a vehicle to provide updates and information on current and forthcoming book projects related to the Discordian Archives. And what are the Discordian Archives? Gheez, I thought you would never ask. The Discordian Archives are, of course, Greg Hill’s archives, who—along with Kerry Thornley—co-founded Discordianism in the late 1950s. Not only was Greg one incredibly gifted individual, but he meticulously saved damn near every project he ever worked on. And that was a good thing. After his death in July of 2000, Hill’s archives were rescued from being potentially tossed into a dumpster by one Dr. Robert Newport, another seminal Discordian and good friends with Hill and Thornley. For a few years, Dr. Bob—as I fondly call him—entertained the notion of creating some sort of online Discordian Archives, but eventually became more interested in pursuing his passion of landscape painting. That’s where I come in. My name is Gorightly, I carry the Sacred Chao. Greg Bishop w/ RAW during 2001 interview. Photo courtesy of Greg Bishop. 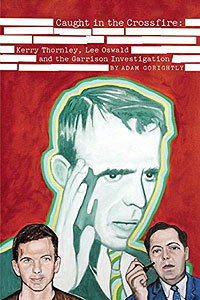 I first became familiar with the Discordian Archives back in 2001 while researching my book The Prankster and the Conspiracy: The Story of Kerry Thornley and How He Met Oswald and Inspired the Counterculture. It was at that time—while conducting an interview with Robert Anton Wilson and Bob Newport at Wilson’s pad in Capitola, CA—that Newport first introduced me to the Archives (or a sampling thereof, as I later discovered.) A couple armloads of material, this modest booty was a veritable treasure trove of rare Discordian Society relics that Newport let me truck home and scan, a sampling of which later appeared in The Prankster and the Conspiracy. Joining me for my meeting with Newport and Wilson was my good friend Greg Bishop, who tape recorded the proceedings for me. Greg had previously interviewed Wilson for his magazine The Excluded Middle back in the early-90s. Sombunall of the Discordian Archives West collection. Courtesy of the Discordian Archives. In the years to follow, I periodically checked in with Newport inquiring if, at some point, I could use these materials to produce a book on the history of Discordianism. Newport, bless his heart, always gave the thumbs up to this potential project, which sat on the Gorightly Productions backburner for the next several years. Every now and again I would touch bases with Dr. Bob just to make sure he was still OK with my eventual use of the materials, and the answer was always positive and supportive. Then, in 2009, as I started getting a bit more serious about moving forward with the project, I yet again contacted Dr. Robert and as always he was totally down with whatever I wished to do. Additionally, Newport suggested that the next time I was down L.A. way I should drop by his place and he would give me the collection and “whatever else I wanted.” Granted, I’m a little dense at times, so I wasn’t quite sure what Newport meant, as I had assumed I’d seen the entire Discordian Archive contents back in 2001 at Wilson’s apartment. Never one to let an opportunity pass, I took Newport up on his offer, and—at that time, by the grace of Goddess Eris—he passed on several boxes of rare Discordian artifacts including the original versions of the Principia Discordia, editions 1—5. These Discordian discoveries, in turn, have led to a number of related book projects.